The building is reportedly equipped with basic cooking facilities and bunk beds. "It is an emergency solution, but it is unavoidable," the mayor of Berlin's Mitte district, Christian Hanke, told the Australian. "There is a lot of room in the hangars." Abdurahman Massa, 20, from northern Eritrea says he doesn’t mind what the building was before. “This is good for me,” he added. The asylum seekers are reportedly provided with €135 each per month to spend on food and other essentials. The information about refugees living in former Buchenwald camp barracks was later reported by the Daily Mail and the Daily Express. However, it is not completely clear whether the premises where the asylum seekers are living were renovated barracks that once belonged to the SS or houses erected after WWII. "The accusation that we in Schwerte are ignorant of our history and insensitive, deeply hit the council and the city administration," Schwerte's mayor Heinrich Böckelühr said at a press conference in January. "There is a lively welcoming culture here. And putting refugees up in mass shelters, containers or gymnasiums is not our understanding of successful integration." 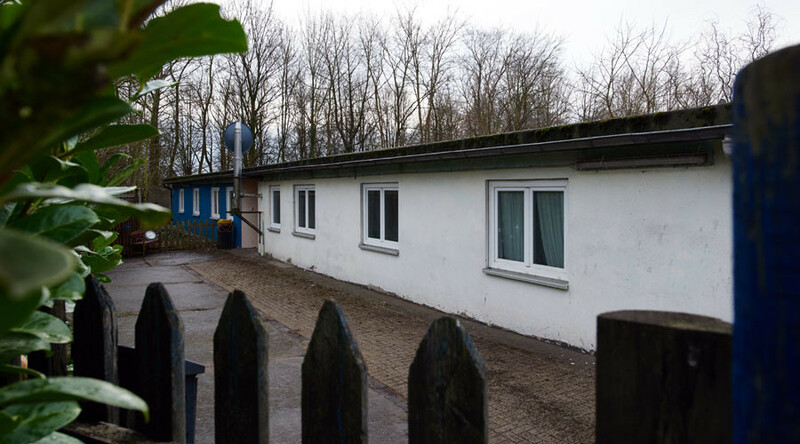 However, Der Spiegel and several other German outlets said the asylum seekers are living in SS guards’ barracks, which still remain in the area, but the prisoners’ barracks had been destroyed. The news that asylum seekers would be housed on the site of the former Nazi death camp first emerged in January. The town's authorities said at the time there were no funds to purchase temporary structures to house asylum seekers. Director of the North Rhine-Westphalian Refugee Council, Birgit Naujocks, told Mitteldeutschen Rundfunk radio that the decision was extremely "questionable" and that the plans recall “bad memories and sinister pictures." Schwerte Labor Camp, a branch of the Buchenwald concentration camp, contained about 700 prisoners in 1944. It was disbanded in December 1944 and its prisoners were sent to Buchenwald. About 250,000 people were held in Buchenwald from 1937 until 1945. Prisoners were tortured on a regular basis and the camp was infamous for its terrifying medical experiments on people. SS medics tried to “cure” homosexuality with hormonal transplants, and they also deliberately infected inmates with typhoid and cholera. At least 55,000 people died in the camp.